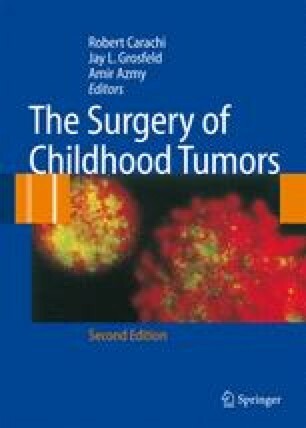 The soft-tissue sarcomas (STS) of childhood are a relatively rare and heterogeneous group of tumors that may occur anywhere in the body and respond quite differently to therapy. STSs account for 7.4% of all cancers in children younger than 20 years . These soft tissue sarcomas are divided almost equally between rhabdomyosarcomas originating from striated muscle and nonrhabdomyosarcoma soft tissue sarcomas (NRSTS). Sarcomas are malignant tumors of mesenchymal cell origin. They are named according to the normal tissue they resemble — for example, rhabdomyosarcoma (skeletal muscle), leiomyosarcoma (smooth muscle), and fibrosarcoma and malignant fibrous histiocytoma (connective tissue), neurofibrosarcoma or malignant peripheral nerve sheath tumor (neurofibrosarcomas, as seen in patients with neurofibromatosis), liposarcoma (adipose), synovial sarcoma (synovium), peripheral nerve sheath tumors (peripheral nerve), and angiosarcoma (blood and/or lymphatic vessels). Other sarcomas include rare entities such as alveolar softpart sarcoma, extraosseous Ewing’s sarcoma, peripheral neuroectodermal tumors, epitheloid sarcoma, and hemangiopericytoma.